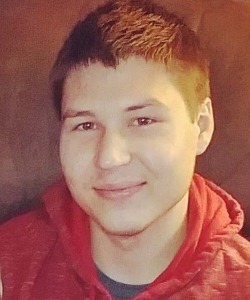 Clint David Jorgensen, age 26, of Oshkosh, passed away on Saturday, March 2, 2019. He is the son of Chris “Jorgie” and Coreen (Meyer) Jorgensen of Borth. Clint was born May 6, 1992, in Oshkosh. He attended Poy Sippi Grade School, Berlin Middle School, and graduated with the class of 2010 from Berlin High School. In 2011 he received his diploma in Electricity from Fox Valley Technical College. Clint previously worked for the Canadian National Railroad, Alro Steel, and Generac. He was currently employed with Oshkosh Defense and recently said how proud he was to work for this company. He took great pride in his work knowing he was working on vehicles for the U.S. military. Clint grew up with a passion for the outdoors. He enjoyed snowmobiling, four-wheeling, motorcycling, boating, and hunting. He loved to watch movies, play video games, and spend time with his friends. Clint was always someone that could be depended on when you were in need. Whether it was to help move something, work on a vehicle, or a listening ear, he was there. Clint left behind his pride and joy, his son Caynen David; parents, Jorgie and Coreen Jorgensen; two sisters and a nephew, Courtney (Matt) Mathia, and Bryler; Chelsey Jorgensen (fiancé, Brad Fuchs); grandmothers, Goldean Jorgensen, Esther Meyer; aunts and uncles, Nancy and Randy Brey, Andy and Toni Jorgensen, Dean and Kerri Meyer, Cindy and David Matthias, Cathy Sponholtz, Carleen and Craig Rohde; cousins, Brian, Jeremy, Matt, Brad, Eric, Laura, Ann, Devin, Jenna, Jens, Alyssa, Riley, Myles, Carter, Camryn, Camdyn, Noralynn, Stephanie, Stacie; as well as many friends. Preceding Clint in death were his grandfathers, David Jorgensen and Ellsworth Meyer; and an uncle, Steve Sponholtz. A private funeral service was held at the Borth United Methodist Church. If you would wish, donations can be made to the Caynen Jorgensen benefit account that has been set up for Clint’s son at Fortifi Bank. If you so desire please submit online condolences to muellerfh.net. So sorry to hear of your loss. Our prayers and thoughts are with all of you. May you find comfort in the Lord and hold your memories close to your hearts. Praying for healing of your profound grief. God bless. I am so very sorry. Soon the Christ, the Savior will rescue us and bring us home. No more tears, no more sadness. I am so sorry about your searing pain now. It will not always hurt this much. Coreen, Jorgie and Family ... my heartfelt thoughts, love and prayers go out to you. Sorry for loss. Our thoughts and prayers are with all of you. My prayers and thoughts are with the family in this time of sorrow. God bless. Thoughts and prayers during this difficult and heart breaking time. May God be with you and comfort you. Hugs and prayers to you all to get through this difficult time ! Our heart aches for all of you ! I send my sympathies to all of Clint’s family. It is hard to fathom how such tragedy can affect so many lives. May God grant you peace and strength during this time. My heart is so heavy???? I love u all???? I will pray on for comfort peace and healing ???????????? Thoughts and prayers to your family at this most difficult time. My heart aches for you all. Praying the Lord wraps his arms around all of you and helps you find some peace. So sorry for your loss. Clint will be missed. So sorry for your loss my thoughts and prayers go out to you and your family. Prayers to your family. The loss of a child is one of the hardest things to go through, I can only imagine the greif and sorrow you are going through. So sorry for your loss, prayers for you and the family. May god take your pain and heal your hearts. So very sorry for your loss! Words can't express the sorrow we feel for your family! Thoughts and prayers for you all. My thoughts are with the families at this difficult time. Thinking of you,sorry for your loss. Our love, thoughts and prayers are with all of you at this time.